T-Force Gaming "THE POWER FROM TEAMGROUP" Elevate your game now! 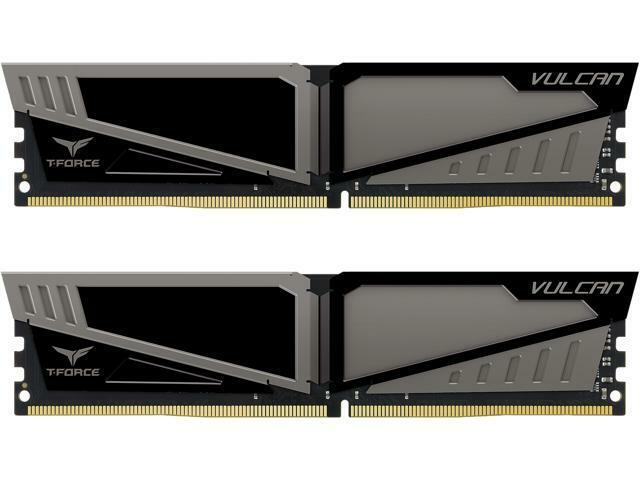 A staple for your new build or upgrade, the Vulcan DDR4 memory delivers the performance, stability and reliability you need at a price you want. 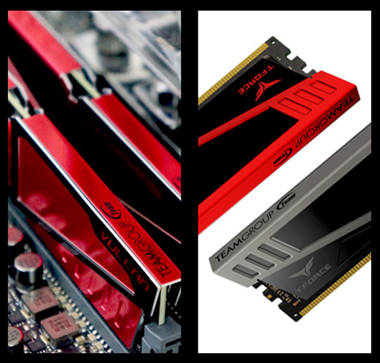 Precision built aluminum heat spreader makes for efficient heat dissipation, while also giving the memory modules an arresting look to cheer up your build. The Vulcan is XMP 2.0 enabled, so you can adjust to the fastest safe speed of the Vulcan with one simple operation—no need to mess around in BIOS. 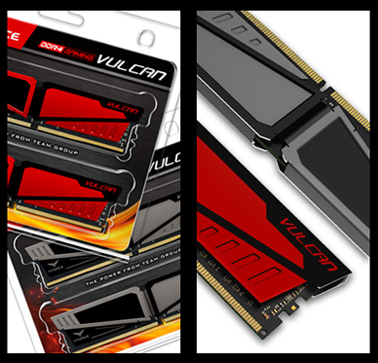 With multi punch press, asymmetric cutting and elegant dual colors design, Team Group Vulcan will make your motherboard stand out from the crowd. You can freely choose from the contrasting colors of black and red, or the calming colors of black and gray. The heat spreader area is extended to the top and the two sides to provide memory a complete coverage of protection and enhance the radiating performance, so the system is able to maintain a long time stable operation. All Vulcan series support Intel XMP 2.0. It is only one click away to experience the high speed sensation of overclocking. With DDR4 Vulcan's low working voltage, it is not only energy saving but it can also reduce the temperature and the heat generated to offer the high speed running memory a stable and long time operation. Multiple compatibility verification with mainstream DDR4 motherboards to make sure its stability with all motherboard on the QVL (Qualified Vendor List). Therefore, you wouldn't' have to worry about compatibility issues when purchasing high speed memory. With high performance and eye-catching heat spreader, Team Group Vulcan is the one you need! Pros: great timings, ramsinks, and fantastic motherboard compatibility. Pros: worked great for as long as it actually did. Pros: ¤ My Ryzen 5 2600, and MSI B450 Gaming Plus recognized this RAM without a hiccup. ¤ Currently Overclocked to 3Ghz @C16 and still cool as can be. ¤ Minimalist design isn't overly aggressive and sits relatively the same height as the bottom of my fan on the Wraith Stealth, so nearly ANY cooler SHOULD work with this RAM. ¤ *EDIT* I have managed to get this ram clocked to 2936Mhz @ with the following timings: 14CL-16tRDC-16tRP-32tRAS @ COmmand Rate 1, which I'd say is pretty darn honorable considering these are *NOT* Samsung B-Die Chips, but are Hynix which most seem to think "Don't play well with Ryzen." I've run memtext x86 completely to check for problems with absolutely none. This doesn't mean that your sticks will do these exact overclocks, but it's worth noting that they're VERY well binned from my experience. ¤ The heatsinks are approximately 1mm taller than the RAM modules themselves, so clearance will NEVER be an issue with aftermarket CPU coolers. Cons: ¤ The only con I have regarding this RAM might be more attributed to the motherboard or BIOS - but upon the first installation and boot the RAM was clocked at 2133Mhz. XMP Profiles allowed it to EASILY be clocked back to 2666, but it's kind of an annoyance to have to double check that things are performing as anticipated. However, given the fact that I could clock this to 3Ghz and save money, and time (since NewEgg was sold out of the 3Ghz at the time of me buying this) I'm DEFINITELY NOT going to take an egg off for this. Other Thoughts: If you're building any kind of minimalist system, or HTPC, mini-ITX, etc. this is a GREAT solution for your box. The coolers sit a mere 1mm away from the top of the ram and do a sufficient job of cooling the banks. They're in no way warm to the touch even with my clocks, and timings. Pros: Good price comparatively, and the gray and black fit with basically any color scheme you could want in your build. Works as expected with no tweaking. Pros: Works great on my asrock fatal1ty h270 with i3-6100 but it down clocked to 2444 because that’s all the mobo supports. Got it on sale for less then $100 and replaced my single stick 16gb unknown name 2166. Other Thoughts: Wish they had more color options but I like painting any way.